7/12/08 Forbidden Zone has been colorized! There's a clip here. It's going to be shown at the Egyptian in Hollywood on July 30th. More details here. You can order the DVD here. 7/12/08 Richard Elfman has updated http://oingoboingo.com and the excellent information on Boingo on Wikipedia. 10/27/06 Nightmare Before Christmas is out in 3D! There's also a remastered soundtrack with extras. 10/5/06 Danny Elfman released Seranada Schizophrana. You can listen to it here. There's also a mailing list for more info. You can preorder it here. 10/23/05 Tony Hawk's American Wasteland features "Who do you want to be today?" Thanks for the pointer, Jason. 10/16/05 Added Little Girls Tab from Justin Delise. 10/9/05 There's an interview with Danny Elfman from KCRW here. 10/8/05 Did anyone else catch Patrick Stewart singing Little Girls on American Dad a few weeks ago? 9/11/05 Johnny Vatos Tribute to Halloween at the Anaheim Grove on October 29th, featuring Johnny Vatos, John Avila, Steve Bartek and Sam Phipps. Should be a great show. I wonder who's signing! Update: Get more info here. 8/23/05 The Corpse Bride website has a music room. I can't wait for the movie! You can preorder the soundtrack on Amazon. 8/5/05 Sally Cruikshank is selling DVDs of her work on ebay, including "Face Like a Frog", which has "Don't Go in the Basement" performed by Oingo Boingo. I just bought one, hopefully more will show up soon. Thanks, NoodleMaps! 8/1/05 I'm sure everyone's seen it already, but Charlie and the Chocolate Factory has music written and performed by Danny Elfman. 5/5/05 A Boingo tribute album will be available soon from http://www.indianolarecords.com/marsplash.html. 2/7/05 John Avila is playing with Mutaytor on February 10th. 12/17/04 The Official Site looks like it's coming back with new content. Thanks Michael! 12/10/04 A Charlie and the Chocolate Factory trailer is now available. 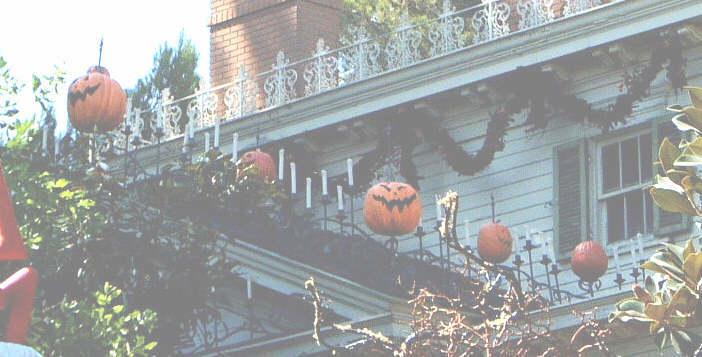 10/9/04 The Haunted Mansion at Disneyland is decorated for Nightmare Before Christmas again. 10/9/04 Danny Elfman did the theme for the new ABC show Desparate Housewives. 9/22/04 Fable, a great new roll playing game for the X-box, was scored by Danny Elfman. It's awesome! 8/29/04 I removed the guestbook. It just became a big spamfest. 8/29/04 Forbidden Zone will be available on DVD on 8/31/04! For a little more, you can get a signed copy. It's also being shown in select theaters. 1/27/04 Danny Elfman has been nominated for an Oscar for the Big Fish soundtrack! 12/5/03 Congratulations to Danny Elfman and Bridget Fonda on getting hitched! 12/5/03 Big Fish starts December 10th in some theaters, and January 9th everywhere. 10/12/03 Added Charlie and the Chocolate Factory link (thanks Neo!). 10/12/03 A bunch of tabs from Kris Miller (thanks!). 3/12/03 www.richardelfman.com reports that Danny Elfman is getting married to Bridget Fonda. Congrats! If you haven't been to www.richardelfman.com in a while, check it out. Lots of cool stuff. 11/5/02 Disney is doing the Nightmare thing at the haunted house again this year. 10/31/02 Happy Halloween! Listen to some Boingo today for old times' sake. I should have some updates soon. 10/31/02 Danny Elfman is a Mac user. 2/16/02 The Boingo Graveyard is temporarily down due to copyright issues. 2/16/02 Added Dead Man's Party Tab from Kilroy Blues. 2/16/02 Added link to Rampant Boingophrenia, which has a Boingo radio. 2/16/02 Added link to PsychoBomb's! Oingo Boingo WebSite! 2/16/02 Added link to Louis Wain site, the EP kitty artist. I actually had a link to this site years ago, but it had moved. 2/16/02 According to Lauren, Richard Elfman is working on a new film "Date or Disaster" with his new wife Rachel. 1/1/02 Added link to Zokosky's page, the author who did the Dark at the End of the Tunnel cover (thanks, Eric!). Wow, Dark at the End of the Tunnel is only $6 at Amazon! Pick it up if you don't already have it! 1/1/02 Added link to The World of Tim Burton and Danny Elfman, an interesting page about Burton and Elfman. 1/1/02 Elfman wrote the main theme to Novocaine. 10/31/01 Happy Halloween! Have a good one and listen to lots of Boingo! 10/29/01 Initial feedback from the "Deadman's Party" House of Blues cover show is very positive. Vatos even made a surprise appearance! 10/27/01 More Vincent is going to be on Exposure on the Sci-Fi channel tomorrow (10/30). Check it out, if you haven't seen it. 10/11/01 More pictures from boingo_freak. 10/3/01 Mikey reports that Danny and Tim have canceled on the Disney appearance. Sorry for anyone who made plans. 9/26/01 Yikes! I accidentally did some damage on the server. Let me know if you see anything broken. The sign hanging over the entrance to the mansion. Pumpkins on the roof (my right as looking at it straight on). 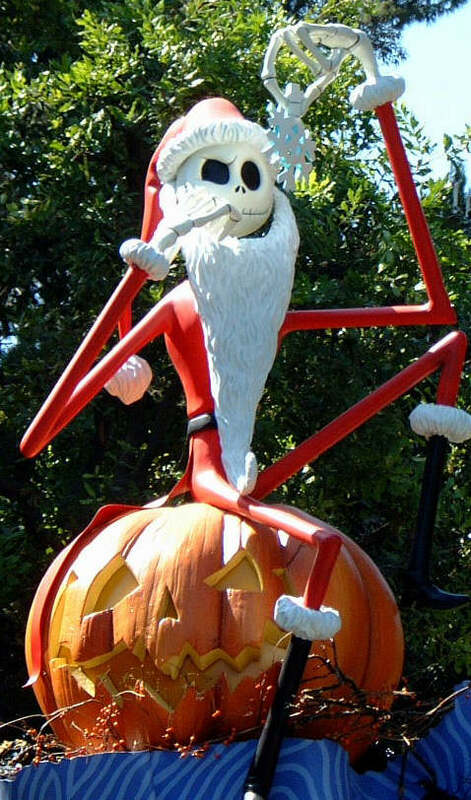 Jack is purched on a pumpkin which is purched on the left of the sign hanging over the entrance. 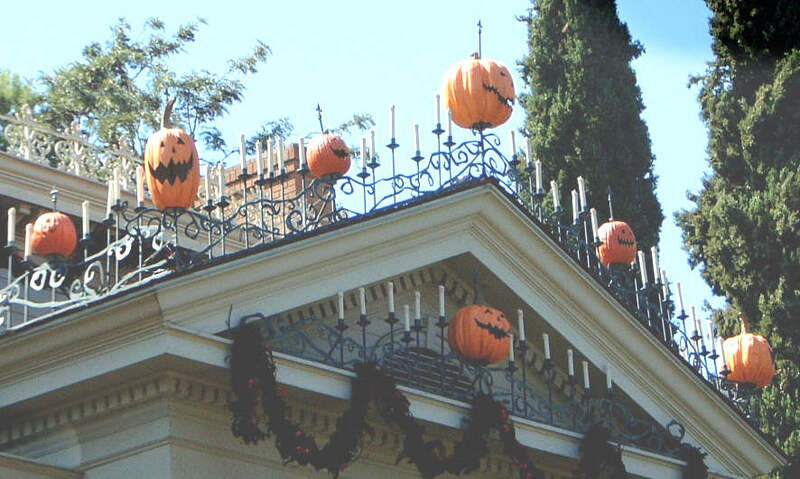 The traditional Haunted Mansion sign revamped with pumpkins on the top of it. Can be found on the right side of the enterence sign. The very top center of the roof. 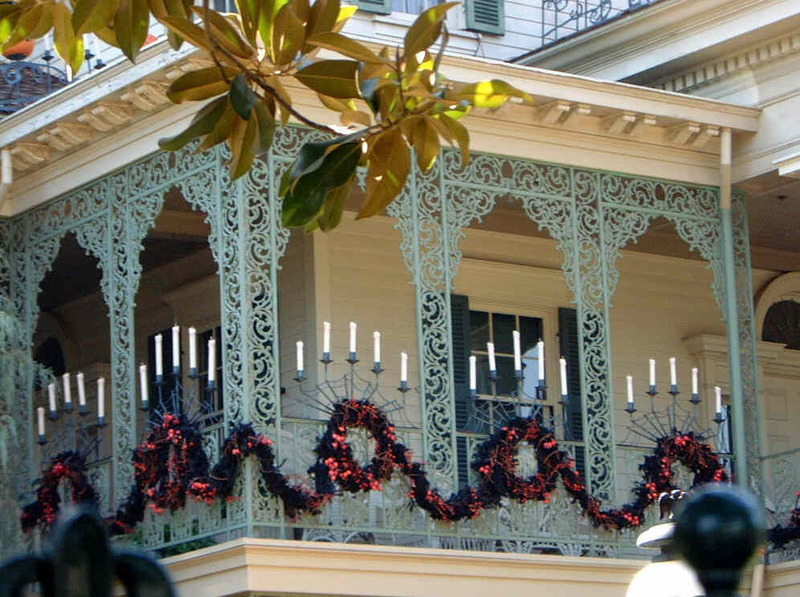 The railing around the mansion is decorated for Christmas. 9/22/01 More info on the Nightmare event and merchandise. Wish I was rich! 9/22/01 http://www.mexicansugarskull.com/ has some cool Dia De Los Muertos stuff including kits for making skulls out of sugar! 9/12/01 Amazon is accepting Red Cross donations here. It's great to see how many people are giving! 9/10/01 The Boingo Graveyard is finally back up! 9/10/01 Mikey reports that the tickets for the event at Disneyland with Burton and Elfman sold out in 4 hours. Oh well. The good news is that some new merchandise is being made for the event. 9/4/01 [Updated on 9/10/01] There's going to be a Boingo tribute show at the House of Blues in Anaheim on October 26th [other venues are not yet confirmed]. It's $20. For more information check out the web site. 8/23/01 More exciting news! Disneyland is going to decorate the Haunted Mansion with Nightmare stuff! It starts on October 3rd, and ends on January 3rd. Danny Elfman and Tim Burton will be there on October 5th. Definitely worth a trip! 7/21/01 Looks like there's also going to be something about Planet of the Apes next week on Exposure on the SciFi channel. 7/19/01 Boingo Freak pointed out that MTV is having a show on the making of the Planet of the Apes, including an interview with Danny. It will be on several times in the next few days. It looks like HBO has something too, although I don't know if they interview Danny. 6/17/01 Added current projects section with info from lots of people. 4/12/01 Lot's of updates coming soon. 2/5/01 The Proof of Life score is available. It's getting bad reviews because people are expecting the soundtrack instead of the score. They need to be set straight! 2/5/01 Elfman is doing the score for Spider Man! Thanks to Jamie for the info! 12/10/00 Word is, Danny Elfman will be at Mann's Chinese Theatre on December 12th at 6:30 p.m. for the world premiere of 'Family Man', he can be spotted on the red carpet. (Thanks to Jeremy Ford). 12/10/00 Danny Elfman appears as a violinist in The Gift. (Thanks to Amphagori). 11/13/00 Family Man is a new movie coming with a soundtrack from Danny Elfman. Click the link to preorder. You can see the trailer here. 10/24/00 Boredmonkey sent a high quality MP3 of Boingo performing Hey on Leno. 10/24/00 I've temporarily put up the old chords/tabs page here. I'll clean it up soon. 10/23/00 Consensus is that All the Pieces is Boingo. I have to admit, I gave up after about 15 seconds thinking it was a Depeche Mode rip off band, but if you listen longer, you can definitely tell it's Boingo. Breese says "ALL TO PIECES is indeed Boingo, from the 1983 sessions for GOOD FOR YOUR SOUL, the band was experimenting with synthesizers and while the song sounds very different it is 100% boingo." 10/18/00 Chris Barker found the Farewell Video at Tower Records online for $13.99. Pretty good deal. If you don't have it yet, it's a must! 10/18/00 Tom sent me a couple of MP3s. One is Hello Satan from Forbidden Zone. And, there's All the Pieces, which I personally don't think is Boingo. What do you think? 10/3/00 Tim Burton's Stainboy is now on shockwave.com, featuring music by Danny Elfman. 9/9/00 Special Edition of Nightmare Before Christmas will be out in October. I love the special edition Laserdisc. You can also get a bundle with James and the Giant Peach. 9/9/00 Edward Scissorhands: 10th anniversary edition is now available, including a running commentary by Danny Elfman! 11/10/99 I'm sure all of you have heard, but there's a new Boingo Anthology which is a good collection of Boingo over time and includes interesting liner notes. It also has Aint this the Life from the EP.